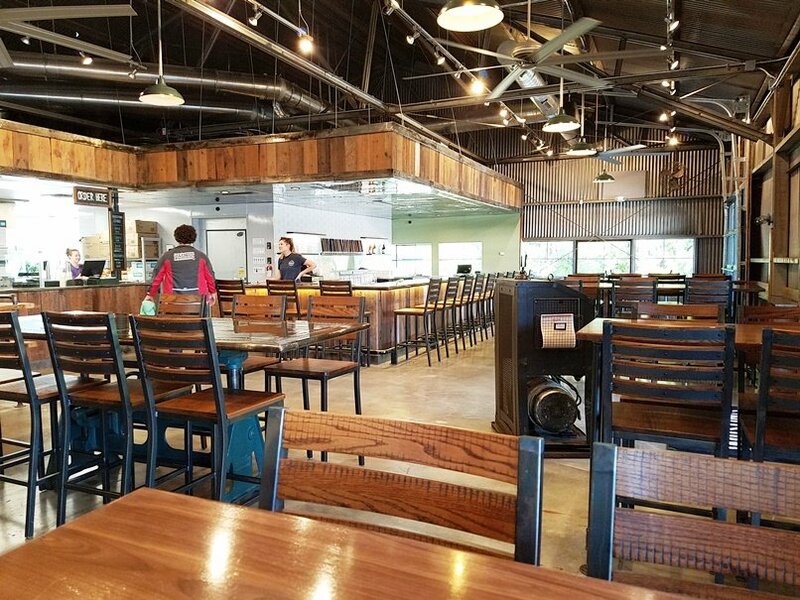 With the recent additions of Hummingbird and Lynnwood Brewing, Raleigh has seen Dock 1053 and its plaza take off in terms of activity! What used to be a concrete and gritty, industrial complex is slowly being transformed into a destination focused on beer, food, retail, and the arts. 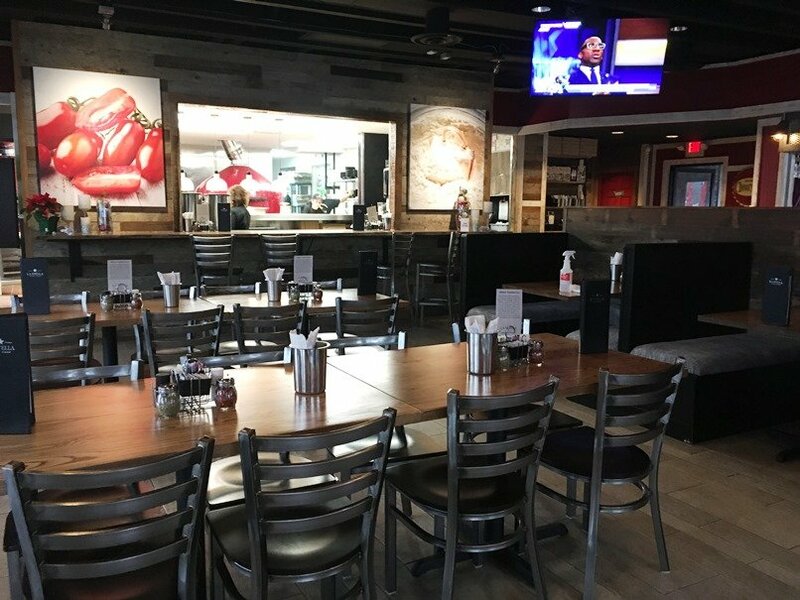 The most recent business added to the Dock 1053 plaza is Wilson’s Eatery! 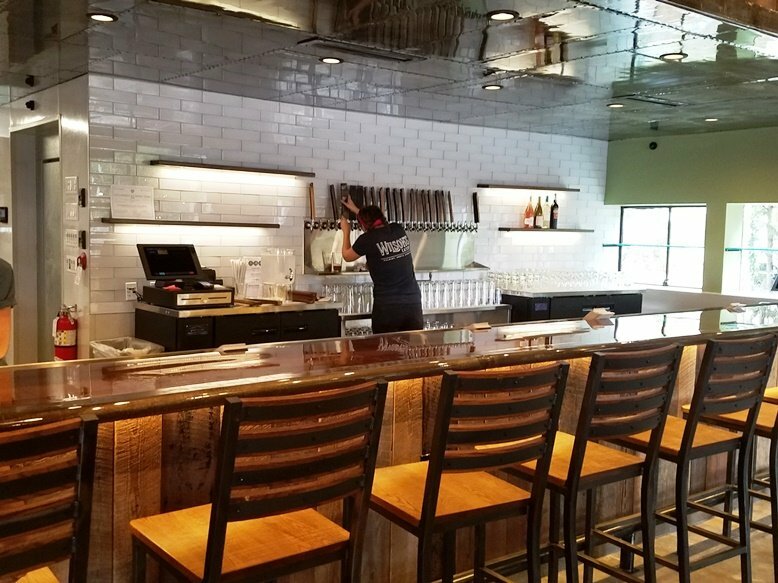 Spun up by the folks from Lynnwood Brewing, the need for a more permanent food offering to serve the beer-drinking masses became readily apparent. (Think Fullsteam and Parts & Labor). I’ve had the chance to drop in for a couple of meals and it looks like Wilson’s Eatery is off to a good start! Given all the businesses in this Loading Dock 1053 plaza, there is plenty of parking. But the complex can get very busy so you may have to be patient or park in the outer areas of the lot during peak periods. Wilson’s Eatery is located right near the entrance (to the left) of Dock 1053 and its location used to be Wendell’s Siding. It’s a practical looking building with a corrugated sheet metal facing, wood factory doors and a beautiful wrap-around patio. 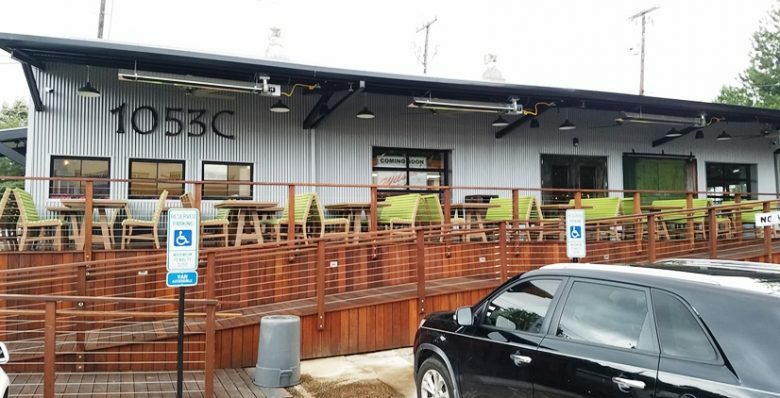 A small connecting bridge to Lynnwood Brewing’s patio means you can carry food and beer over between the two businesses without ever hitting up the public lot. It’s a nice layout if you intend on spending some time here, drinking AND eating. 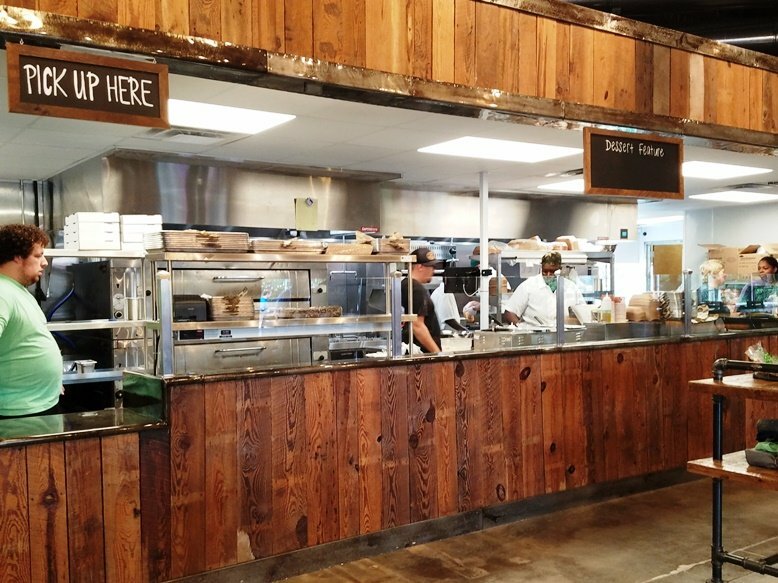 Inside Wilson’s Eatery, the industrial theme continues with its decor. 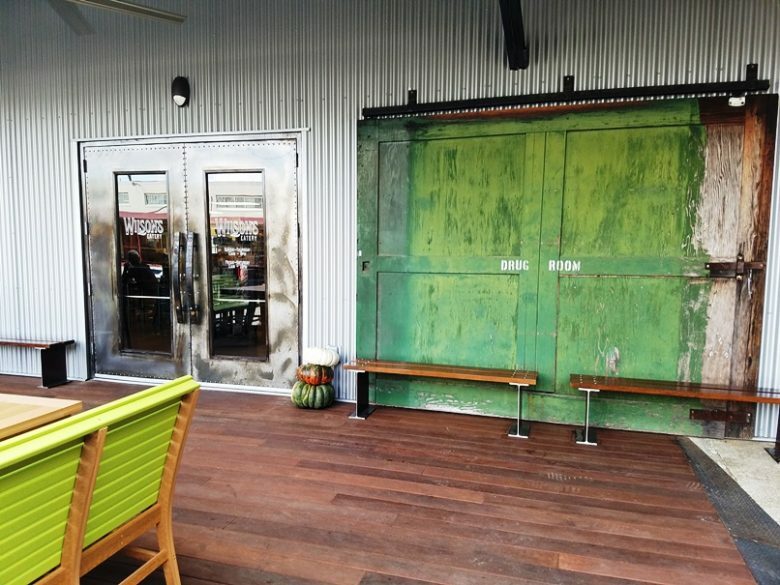 Polished concrete floors, sturdy wood and metal seating, the corrugated metal is left intact for the interior. Exposed metal beams stretch out overhead along with some large ceiling fans. 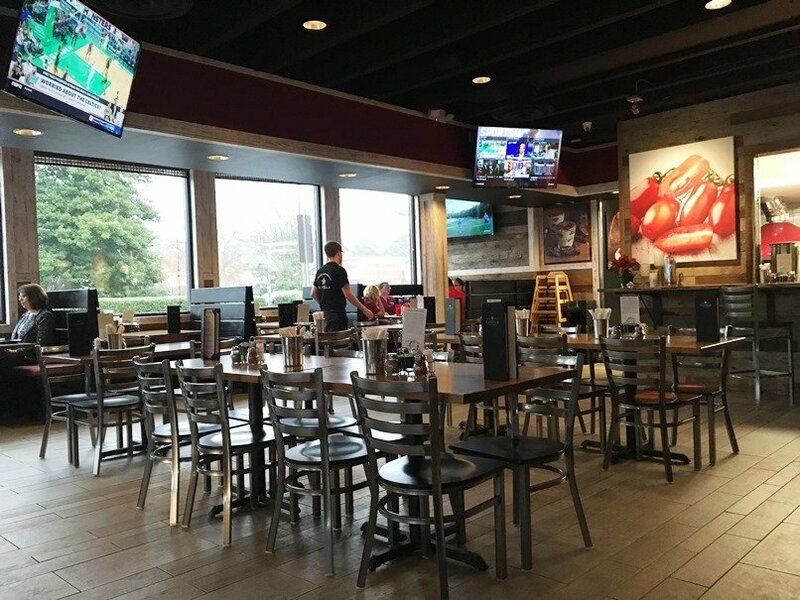 It’s a large, open dining space with a bar area to the right and the order counter back-center. A hostess kiosk up front carries the Wilson’s Eatery menus, grab one and order at one of the two cash registers in back. 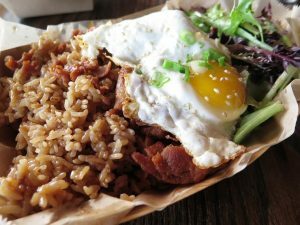 Wilson’s Eatery is probably best classified as a casual American grill. Sandwiches, salads, flatbreads, along with a small selection of appetizers. The ingredients and sandwiches are spun up a bit with pork belly and arugula but everything is pretty much under $15. And as you can guess, there’s some great options for beer at Wilson’s Eatery along with craft, in-house sodas (cherry-cola, root beer, etc), just be aware that you don’t get refills on the in-house sodas. Once you order at the counter, you’re buzzed on your smartphone with a text so when the order-taker asks for your number, she’s not flirting with you! After you order, feel free to grab some condiments, cutlery or napkins at the self-serve area to the side. For sandwiches, I can definitely recommend the BLT made just a bit more decadent at Wilson’s with pork belly! Served up on thick-cut white bread, shredded lettuce and tomato, there’s plenty of belly in this sandwich and it’s perfectly seared with the luscious mouthfeel you expect out of pork belly. 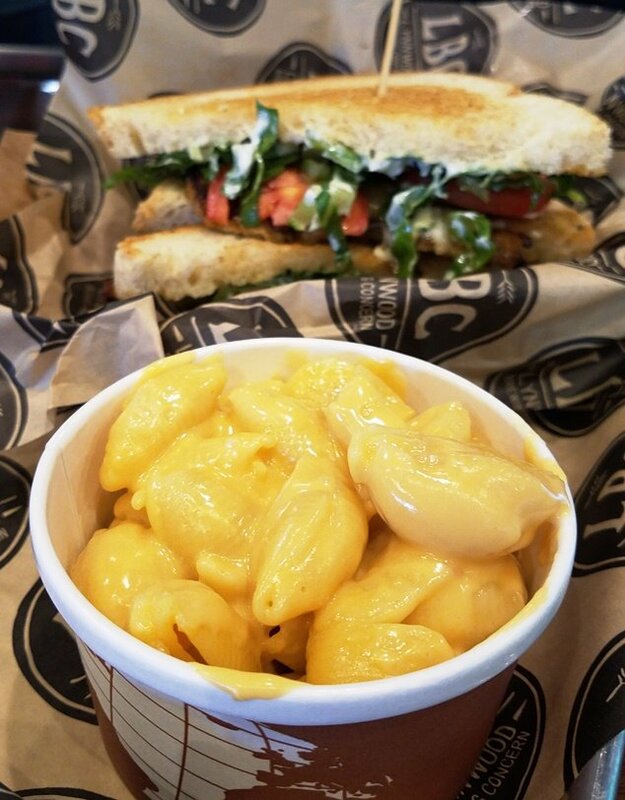 Note that the sandwiches and Wilson’s Eatery come bare so you’ll likely want to pair it with a side (fries, slaw, beer cheese mac, broccoli salad). 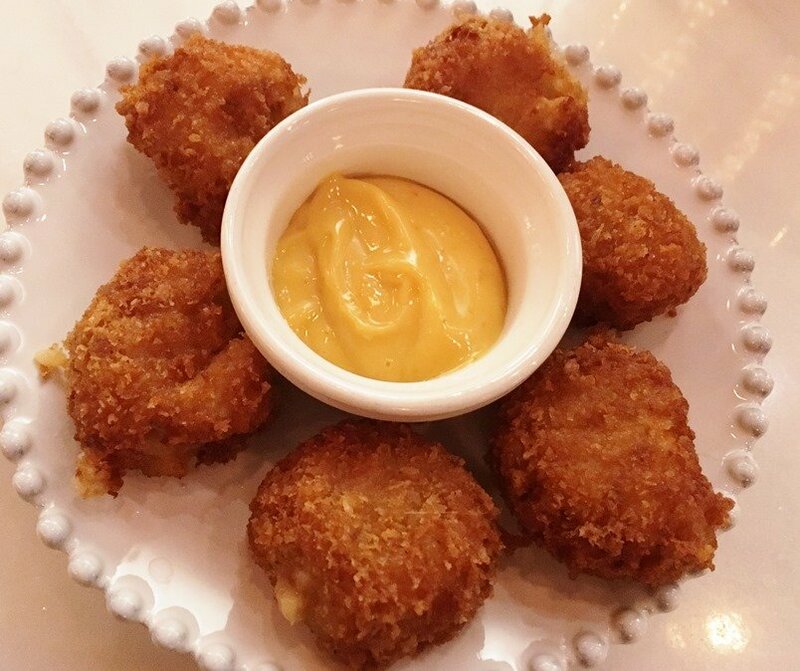 A big thumbs-up for the rich and creamy, mac n cheese! It’s made of orechiette shells holding creamy, cheese sauce in its tender pasta. 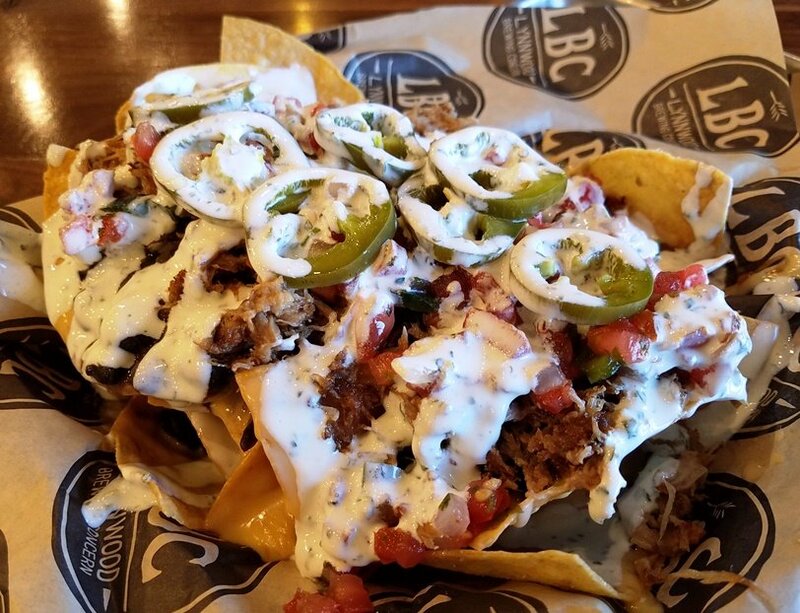 The nachos are served with pulled pork, jalapenos, beer cheese and crema which makes for a tasty mess. Not a bad starter but I would have preferred more of the beer cheese and less of the crema which overwhelmed the dish. Right now, I’d say stick to the sandwiches and flatbreads versus the other options. Note also that most food here at Wilson’s are served in paper containers, food truck style. A third visit gives me an opportunity to the the flatbread at Wilson’s Eatery. But I admit that I would personally call it a pizza, as much as anything! But who cares what you call it because, Wilson’s dishes out a great flatbread-pizza. The Old School is spun up with tomato, mozzarella, sausage, pepperoni, peppers and red onions, a classic combo. Loved the crust which was light but chewy and the balance of sauce, cheese and meats was excellent. Paired with a LBC black IPA made for a great meal. 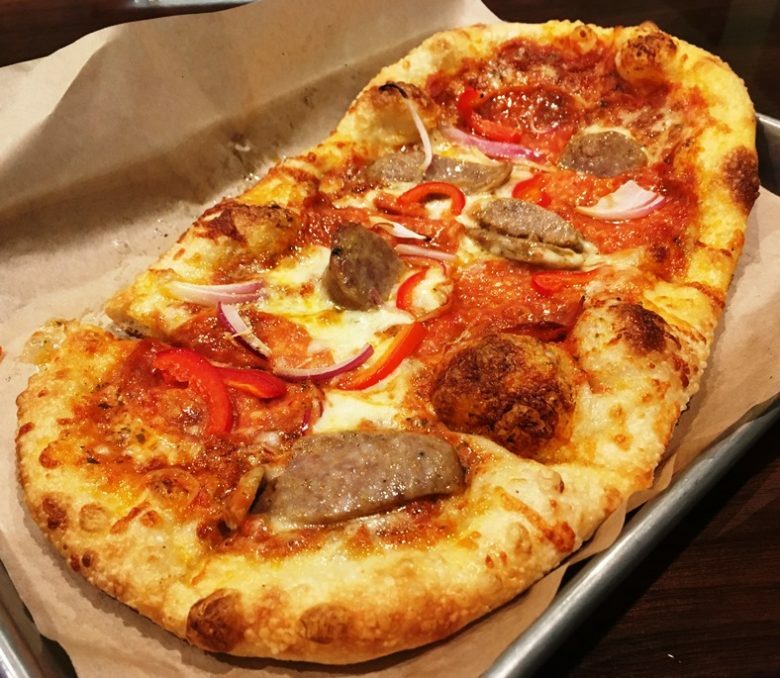 I’m definitely eager to try more off the flatbread list. It’s great to finally have a food complement to the wonderful Lynnwood Brewing. While the beer was always good, it tastes even better with the excellent eats here. Wilson’s Eatery is off to a good start with its array of gourmet sandwiches, flatbreads and plates done up in a casual warehouse setting. 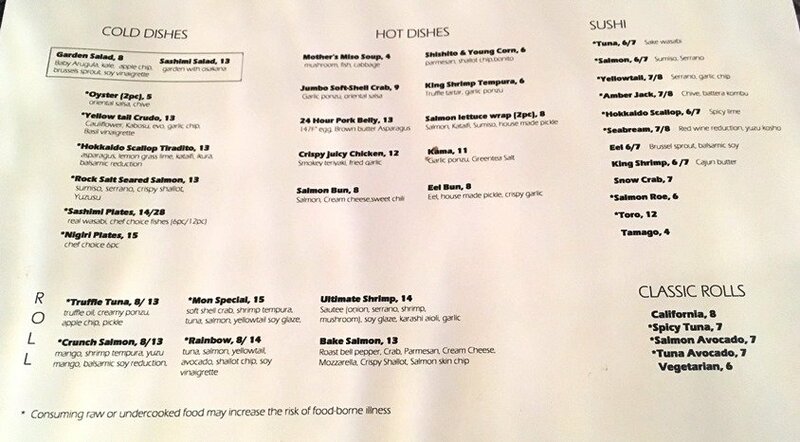 And I suspect that they will continue to tweak and evolve the menu over the next six months. While it’s not perfect, the great space and patio make for a wonderful addition to the Dock 1053 party! Here’s to more and better from Wilson’s Eatery in 2019. 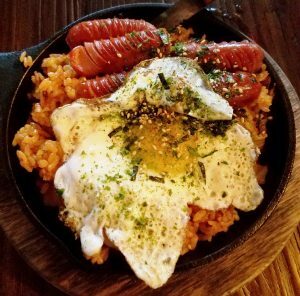 Usually at the end of the year as a food blogger, I’m trying to wrap up my visits to new restaurants to pull together my list of the best. And every now and then your plans get thrown awry by a new and excellent spot. This year it was Sushi Mon out on Hillsborough Street in Raleigh. An invite to visit hits my email inbox and I had seen some very positive reviews for the place so who can resist? 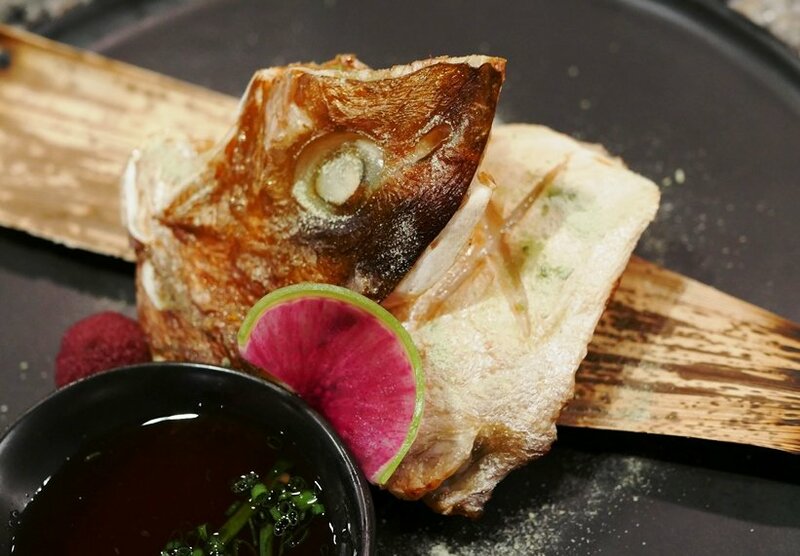 I head over on a chilly Thursday evening to see what this new Japanese restaurant is about. Sushi Mon is conveniently located off of Hillsborough Street in Raleigh in the old Mama Jee space I was so fond of. For first-timers looking to visit, parking is not super obvious. The lot next to restaurant actually belongs to Zaxby’s so do NOT park there! You’ve got options around the corner, in the Stanhope building structure or do what I do, park over on Dixie Trail and walk over. 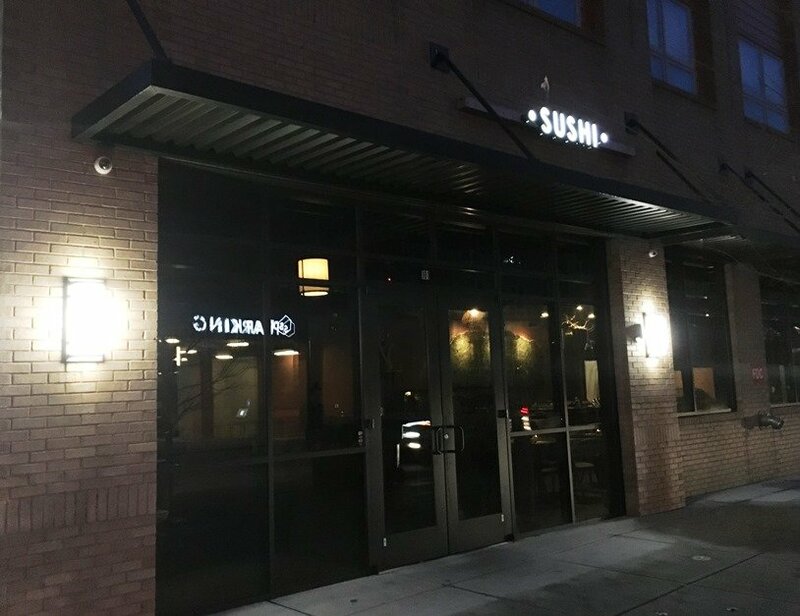 The front to Sushi Mon is dark and subtle but it sits right at the corner. Inside you’ll find a super-cool and hip, urban oasis, perfect for a fun date or small dinner party. I’m met by the owner, Chris Lee who shows me around the place. He points out many of the unique pieces of decor at Sushi Mon, all sourced in-state! 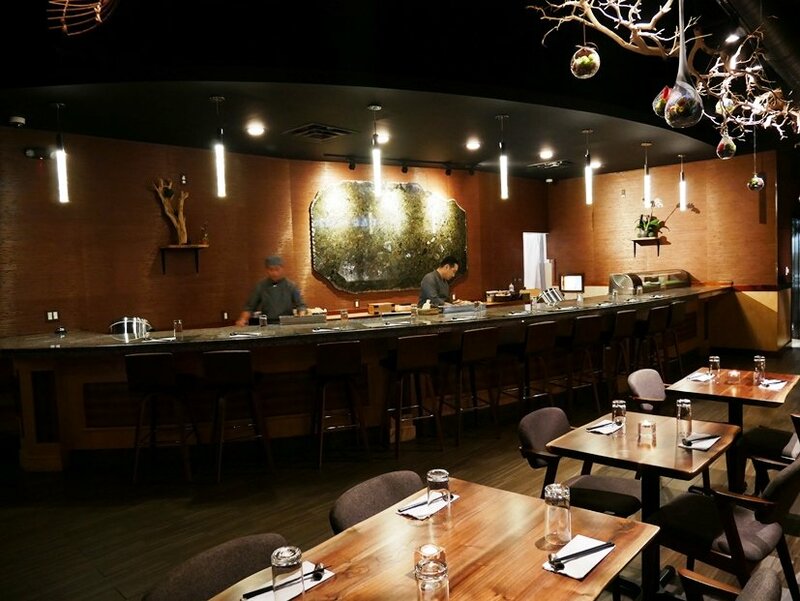 From the tables made at Raleigh Reclaimed to a polished granite installation behind the sushi bar from Asheville, a lot of the exquisite decor at Sushi Mon was made right here in North Carolina. 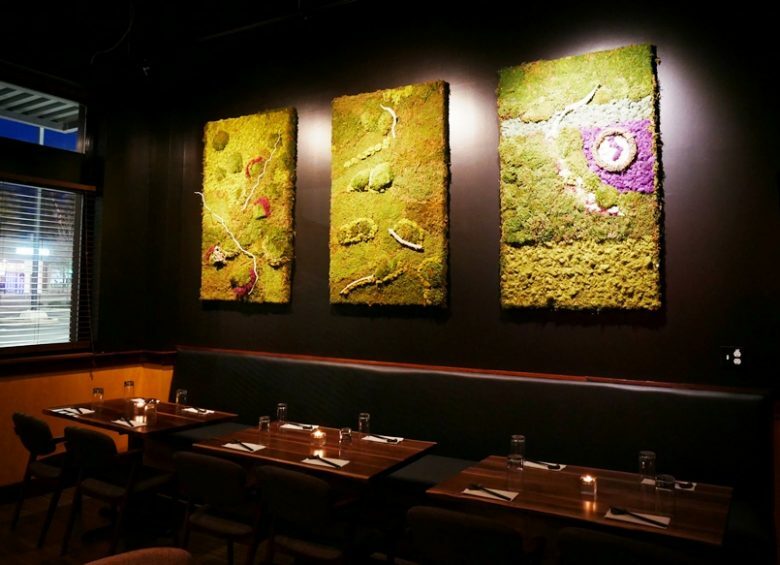 The piece de la resistance is the live moss wall-hanging on the side, very very cool! 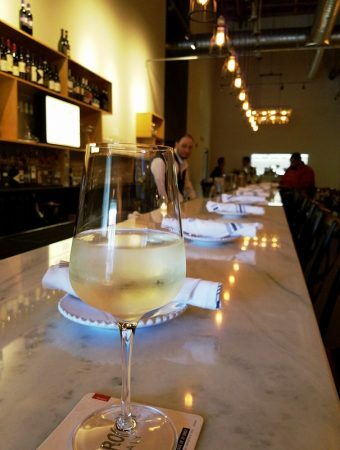 Overall the space has a very slick, West coast feel that would be good for an upscale dinner or date. Both Chris and Sushi Mon’s chef, Tom, have previously worked in the South Bay (CA) and Las Vegas which now makes more sense. But I’m sure you’re wondering, how about the food? Sitting at the sushi bar, we start our meal with the miso soup. Now I don’t know about you but miso soup is usually not something to get excited about. A bit of broth with seaweed and tofu cubes usually just cleans the palate but not the miso soup at Sushi Mon. 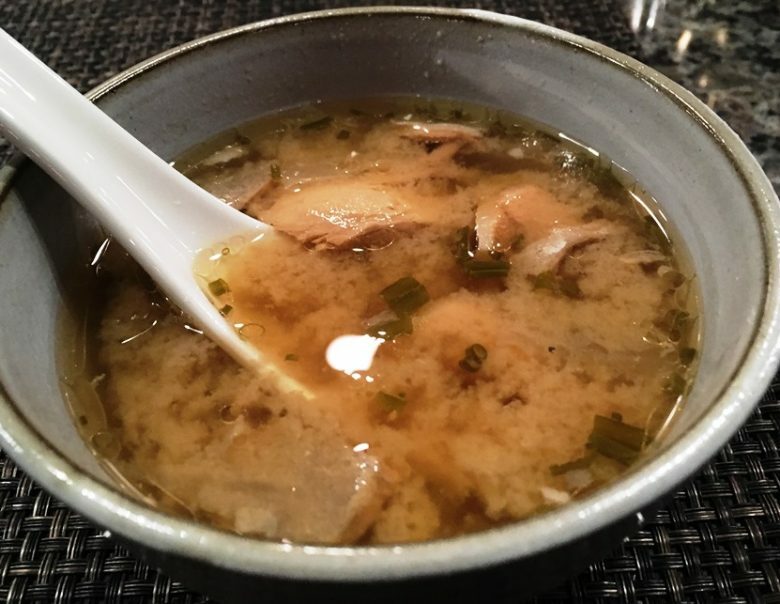 Their version (known as Mother’s miso) is a thick, cloudy broth laced with salmon, mushrooms and more, wow! Lots of flavor and umami in this little bowl so enjoy it. Sushi Mon’s menu is small but focuses on cold and hot appetizers, sushi (nigiri) and rolls. For appetizers, we opened up with the oysters which are beautifully prepared with oriental salsa and chives. 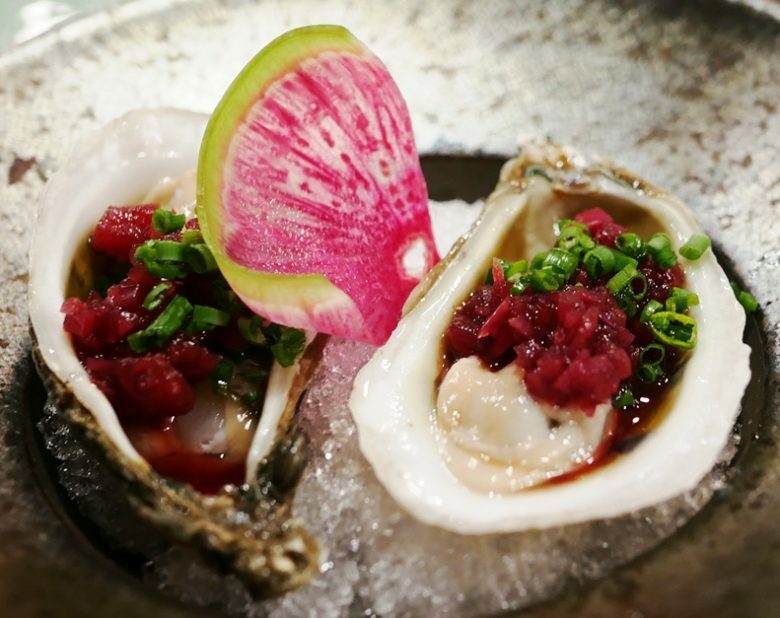 A fun and colorful play to these popular bivalves offering up more flavor then the typical mignonette! 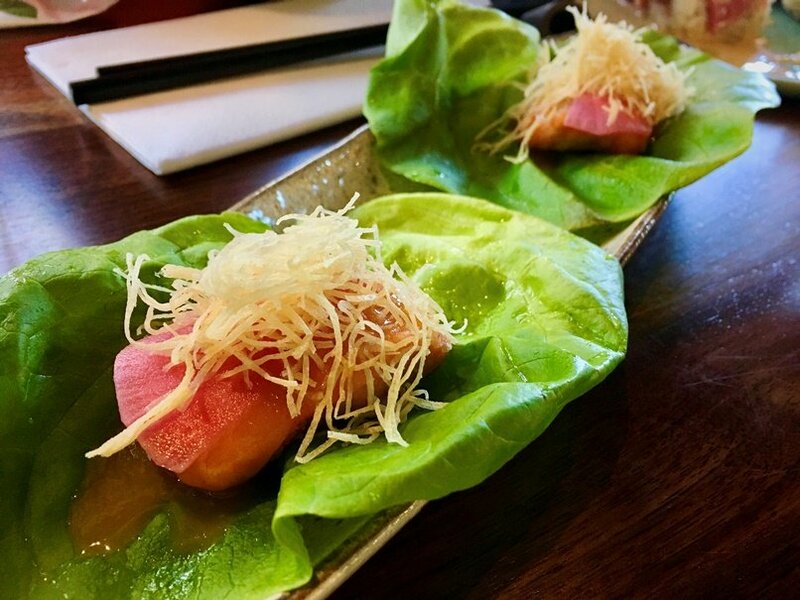 We move on to a seared salmon in lettuce wrap which is topped with thin strings of kataifi. A savory but clean presentation with warm and cool, savory and crunchy for the palate. 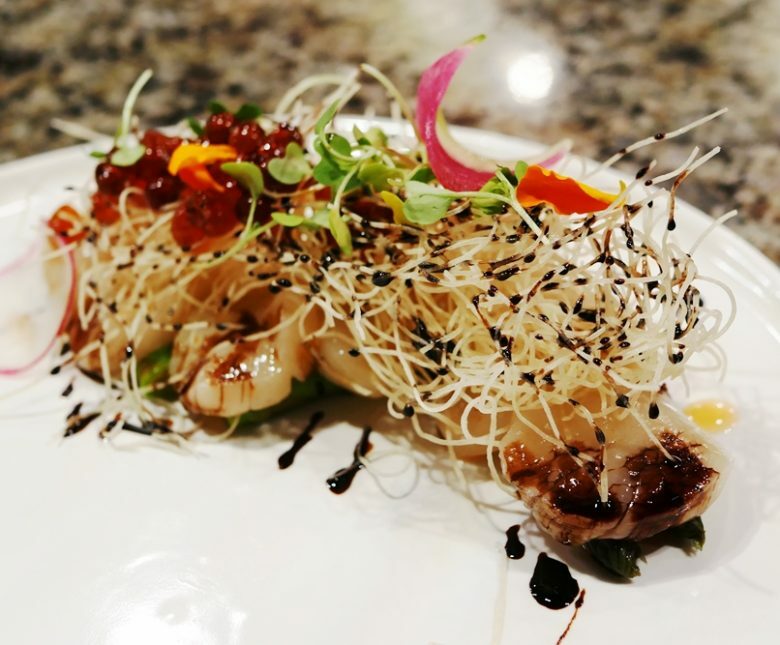 Next up is Sushi Mon’s Hokkaido scallop tiradito drizzled with balsamic! An artistic dish offering a bit of soft, supple scallop with the crunchy strings featured in the previous appetizer. There’s definitely a subtle contrast of flavors and textures here at Sushi Mon. We follow up with a seared Kama dish, grilled sea bream fish cheek with yuzu salt which is a simple but wonderful preparation of super tender, white fish with just a hit of salt. 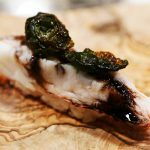 You work out the fish meat around the bone and it’s super-moist and tasty! Next up is an array of nigiri ranging from sea bream, king shrimp, and salmon! 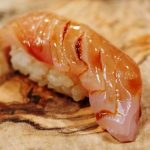 Sushi Mon offers up its nigiri with all the extras. Either a soy sauce (home-made) lacquered on top, wasabi spread underneath or whatever else Chef Tom is inspired by. 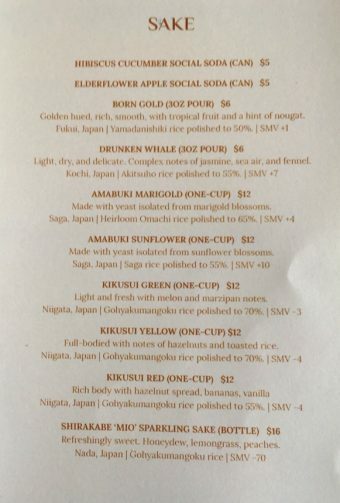 The nigiri is in the $6 to $7 range with custom toppings for an additional dollar which I’d recommend for some unique taste combinations. 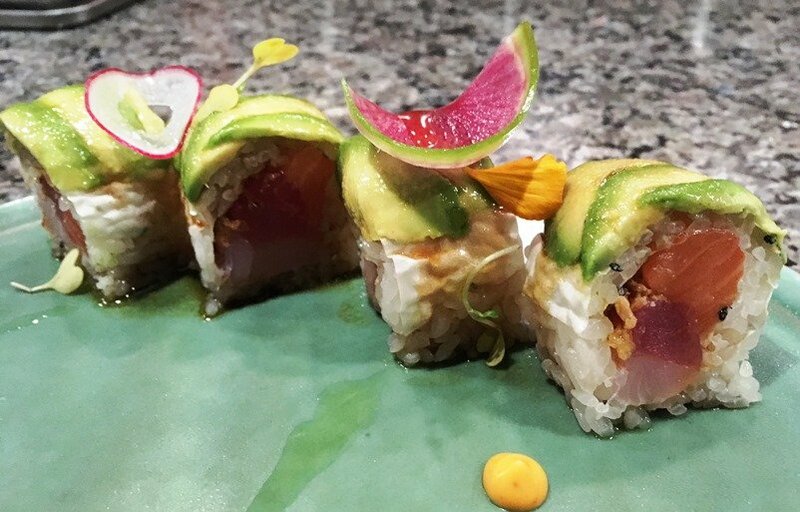 And while we are slowing down for dinner, Chef Tom offers up their version of the Caterpillar roll: tuna, salmon, yellowtail and avocado in a dense, sushi-rice spiked roll. A great finish to a long but indulgent dinner. 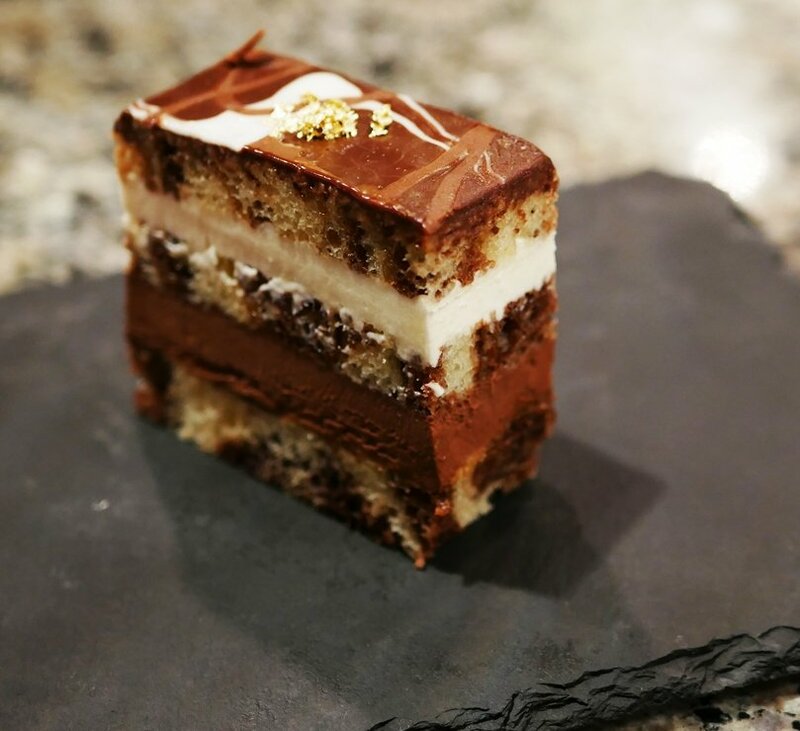 Sushi Mon surprises us with one last plate, a small slice of tiramisu with gold leaf to finish off the meal and I was impressed. I really had no idea what Sushi Mon was about and had expectations based upon the previous business in this space, a favorite of mine, Mama Jee’s. But I was very pleasantly blown away but what they are doing here at Sushi Mon. With an upgraded interior, excellent Japanese food and sushi, along with friendly service, they are really trying to upgrade the dining scene on Hillsborough Street and at NC State. And while I wouldn’t expect to get out of here for less then $40, the overall experience is worth it. 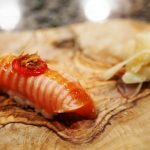 Sushi Mon is also adding ramen for lunch along with an omakase (Chef’s choice) tasting menu soon which will give you some other dining options. So enjoy Sushi Mon for what it is, an upscale Japanese and sushi dining experience for Raleigh. And I promise you that once you find parking, you’re in for a culinary treat at this special restaurant! Over the past year or two, the Warehouse District has been popping! With the new Union Station and Dillon building opening up, there’s an expectation for a lot of future growth in this neighborhood. And along with living quarters and transportation, you’re going to need some restaurants to feed all these people, eh? 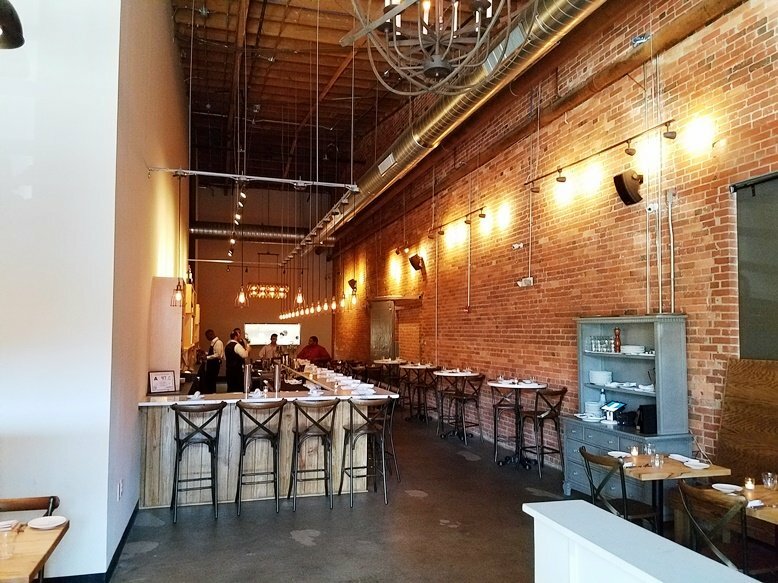 Well out at the Dillon building, we’re starting to see some new restaurants come to life and Heirloom Brewshop is one of the more recent additions. Offering up coffee, tea, sake and some snacks, this hip and modern space will give you some ideas on where the Raleigh food scene is headed towards. Step on inside and let’s go check it out! From the outside, Heirloom looks pretty simple with gold, gilt lettering out front and a large glass face for maximum visibility. Walking by, you can see the milieu of young hipsters chatting away and working on their MacBooks. Inside you’ll find a modern but organic feel to the space. Primarily light woods and whites, there’s a trellis of sinuous wood slats overhead, highlighting the space. It all feels a lot like if Bida Manda and Brewery Bhavana got together and had a baby coffee shop! But it all works quite well, it’s a very clean space from an interior design perspective. 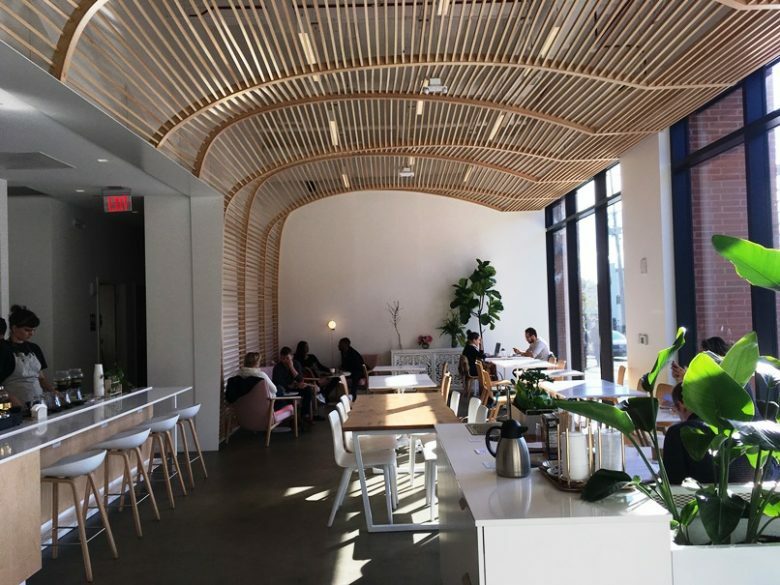 Conceptually, I think Heirloom mimics a modern Asian tea shop in terms of esthetics and design. At the counter order area, you’ll spy an interesting array of brewing equipment. 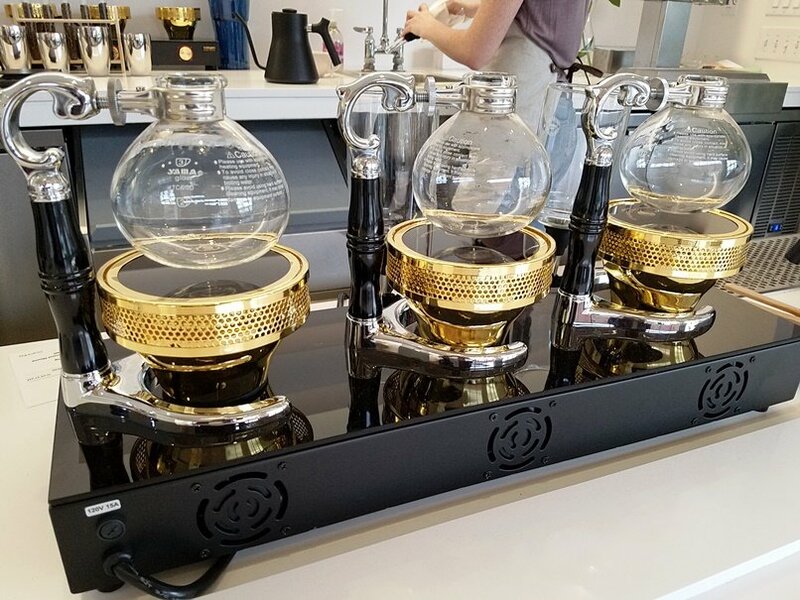 From a wild-looking cold drip coffee distiller to modern, fusion tea brewers, they definitely spared no expense when it comes to brewing equipment here at Heirloom. Everything is displayed out in the open for your viewing pleasure. 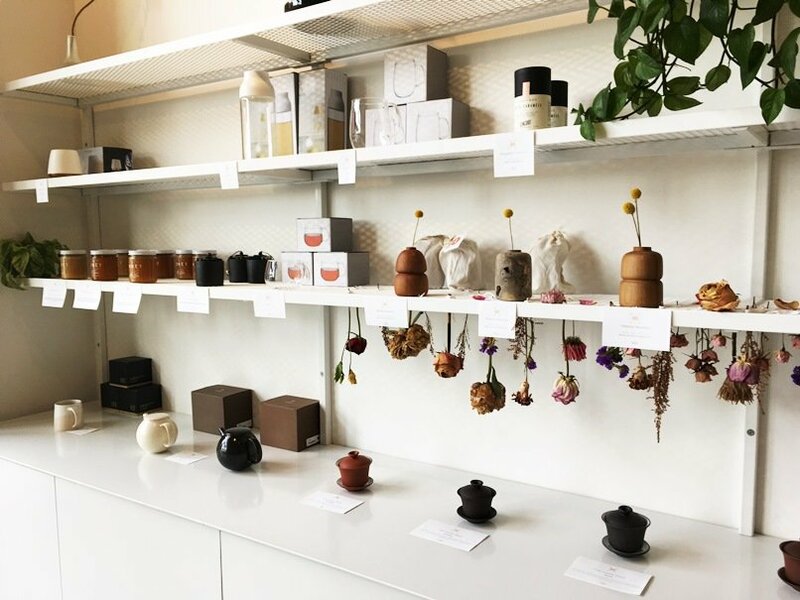 To the left of the counter is a retail space showing off a variety of tea products along with a selection of sake cans. 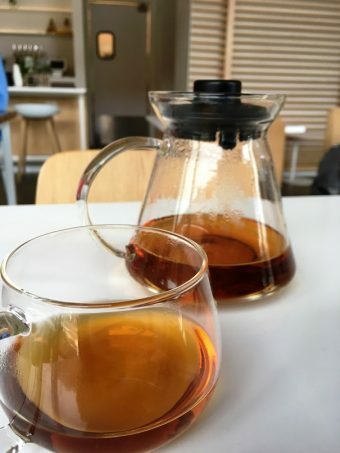 Peruse through Heirloom’s menu and you’ll find a nice range of teas, coffees, sakes, cocktails and small plates to choose from. There’s also a display case of pastries to snack on, up front! Heirloom is open from 7am to 10pm (11pm on Friday and Saturday) making for easy access. 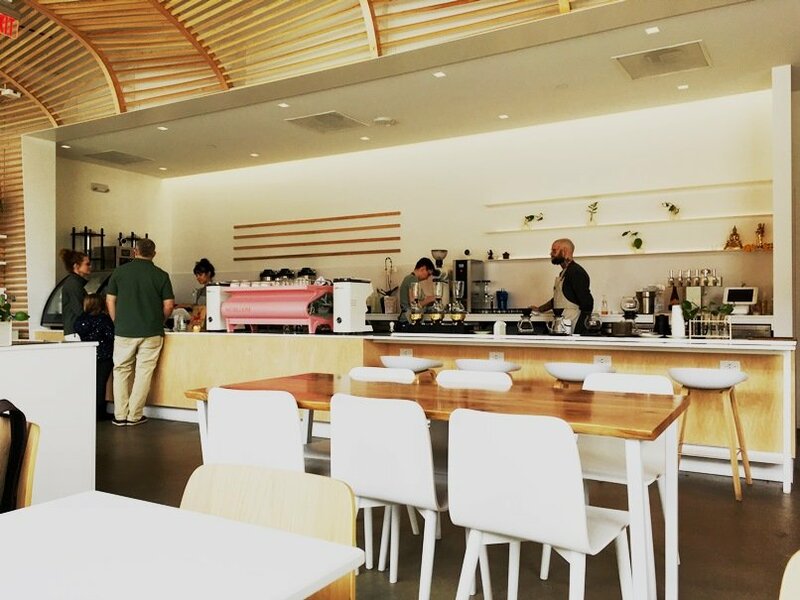 After you order, grab one of the small two-tops or hang out at the counter stools up front. Heirloom Brewshop provides a power-strip up by the front windows if you need to charge up your MacBook or laptop. The space is built for comfort, conversation and a lingering visit. Acoustics are decent here and it’s a good spot to have a quiet conversation. It all feels very comfortable and organic, Heirloom Brewshop provides a Zen-like feel to your visit. 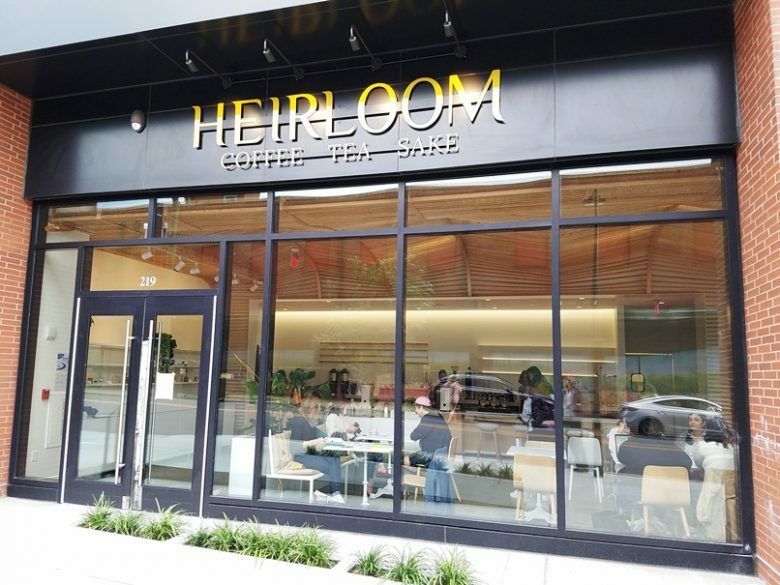 Heirloom offers a great variety of brewed coffee, pour overs, cortados along with Asian oolong, jasmine tea and more. Check out the menus below for details. 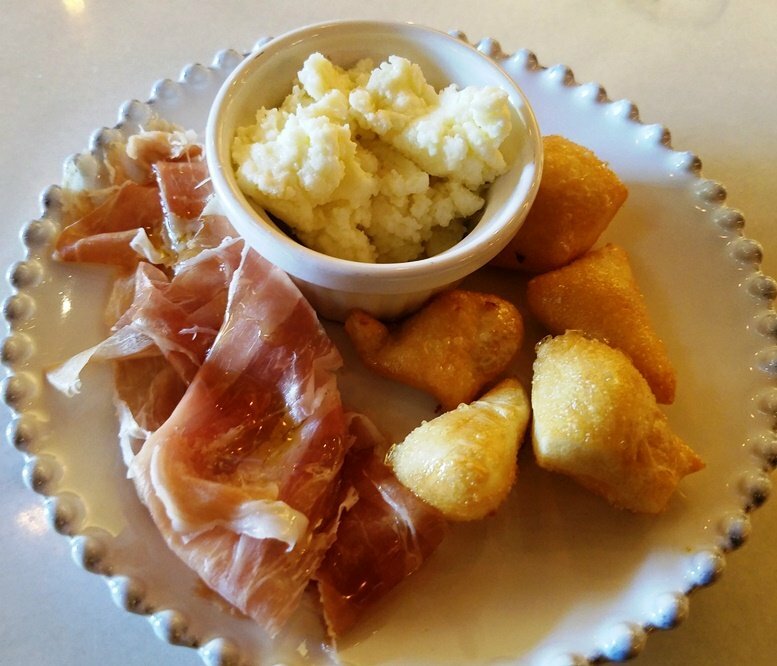 And while I’m certainly a fan of Heirloom’s teas and coffees, explore the small plates menu! 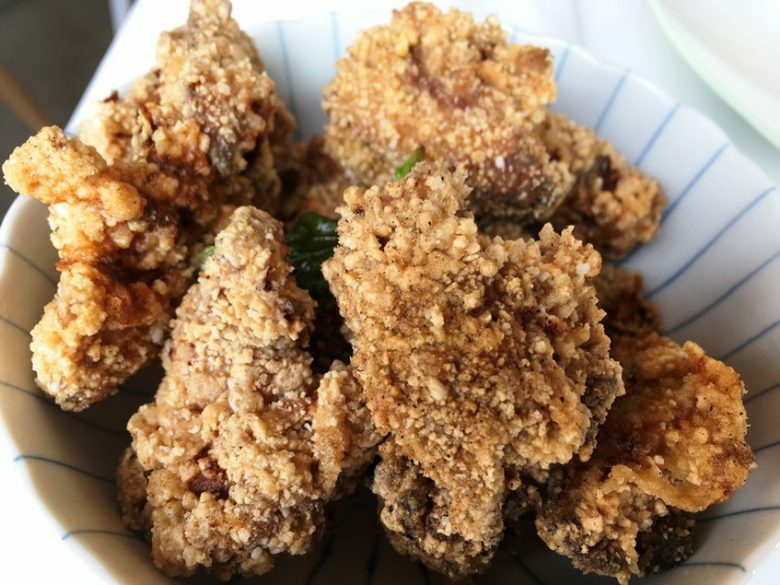 With very Asian options such as fried Lotus root, chilled noodles and Taiwanese chicken, you can enjoy a snack with your drink. 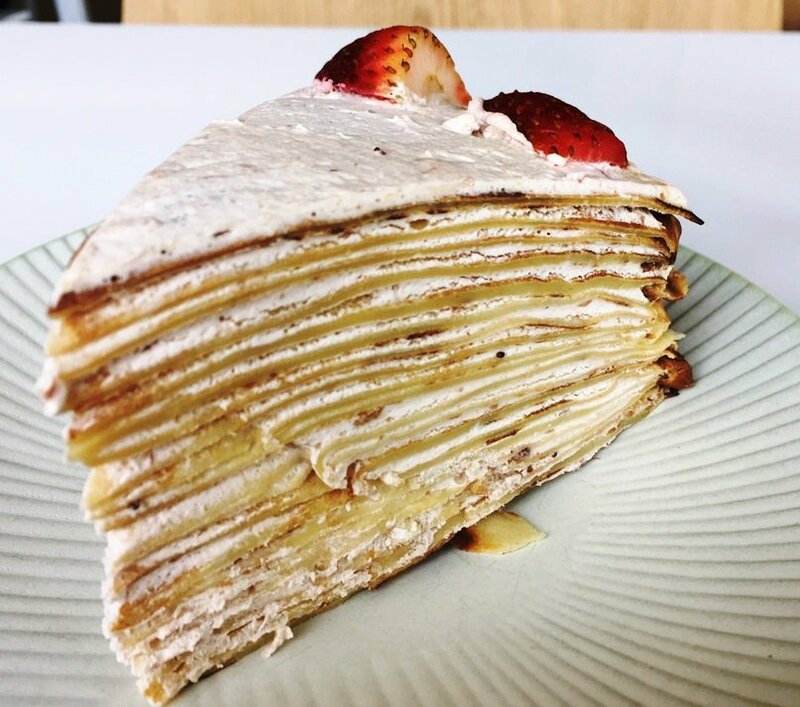 I also tried a really unique strawberry sakura crepe cake. A thinly layered (25+) stack of thin crepes with alternating buttercream frosting. Not super-sweet but the texture of this Sakura cake was really interesting. All in all, it’s hard to really describe Heirloom Brewshop but I think it’s ahead of its time here in Raleigh. Part coffee shop, part lounge, part eatery, there’s a little bit for everybody here! They are pushing the envelope when it comes to hot-brewed drinks and certainly taking some chances with their in-house pastries. Just enjoy it for what it is, a relaxing garden setting for hot drinks, snacks and conversation! 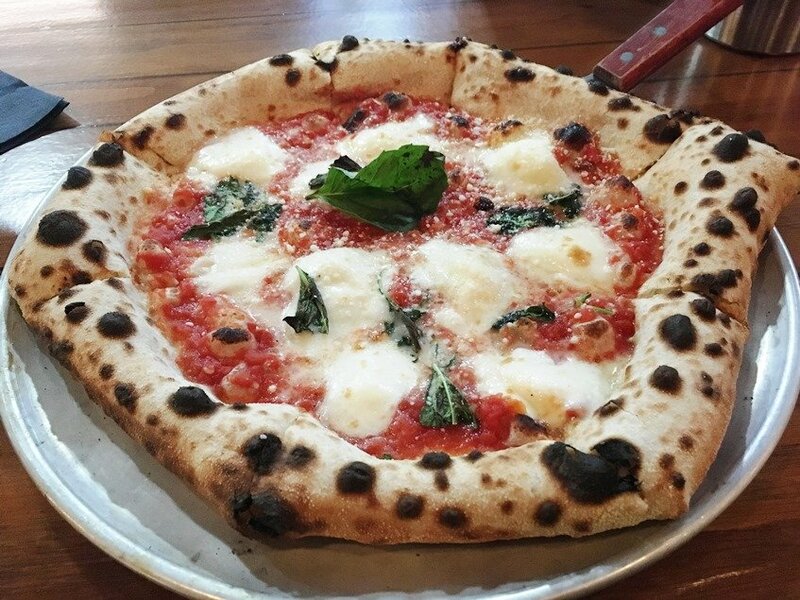 While I’m a huge pizza fan and pretty much love it all, there’s something about Neapolitan pizza that just hits the spot for me! Between the tender, fluffy crust, tangy tomato and fresh mozzarella, pizza purists tend to focus on great Neapolitan pizza. So color me curious when I heard Pizza La Stella was launching a second location out in Cary. I was familiar with their downtown Raleigh location but felt they spun the concept of Neapolitan pizza too far from its origins to take them too seriously. There are very specific guidelines around Neapolitan pizza and most restaurants take some liberties around them. But I was hopeful heading over to the new Pizza La Stella Cary, hopes that would prove to be fulfilled with its new chef, Massimo Di Lascio! 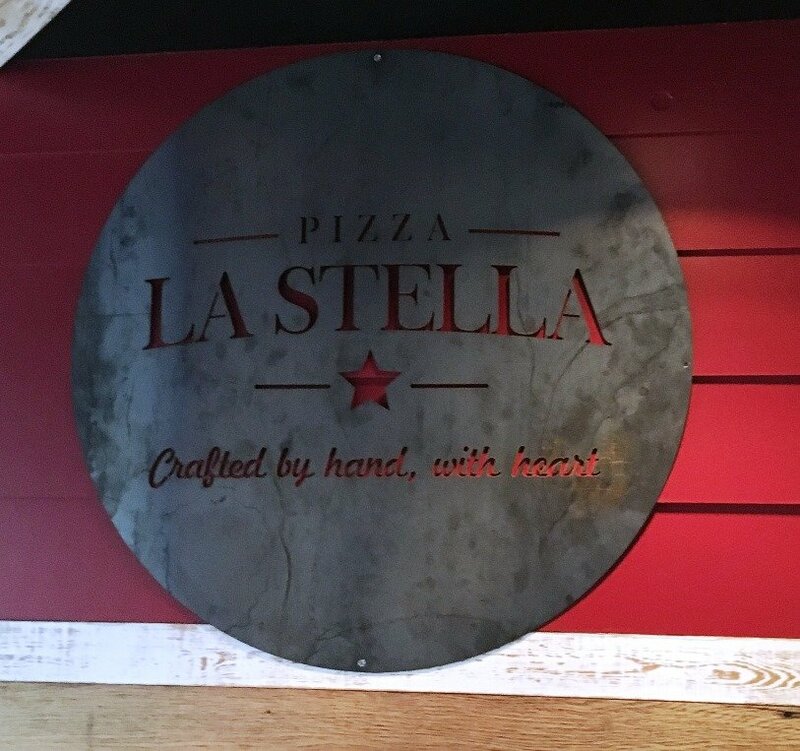 Conveniently off of Kildaire Farms Road is where you’ll find the new Pizza La Stella! Located in the old Hurricane Bar and Grill and across from the very busy Trader Joes, this parking lot gets slammed but thankfully they are located on the quieter side of things. A neat, little patio with umbrellas sits to the side with lights strung out overhead. Probably a great spot for a meal once things warm up! 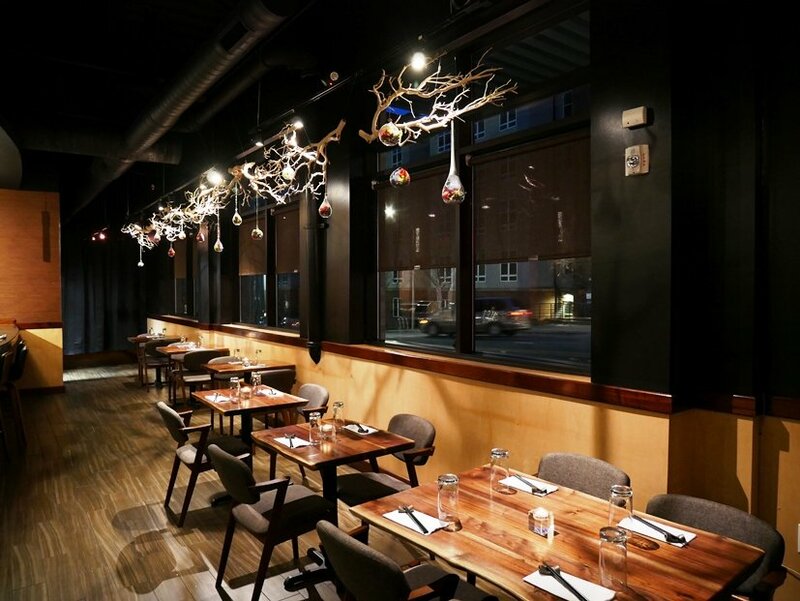 Inside, Pizza La Stella is decked out in dark woods along with a few TVs. 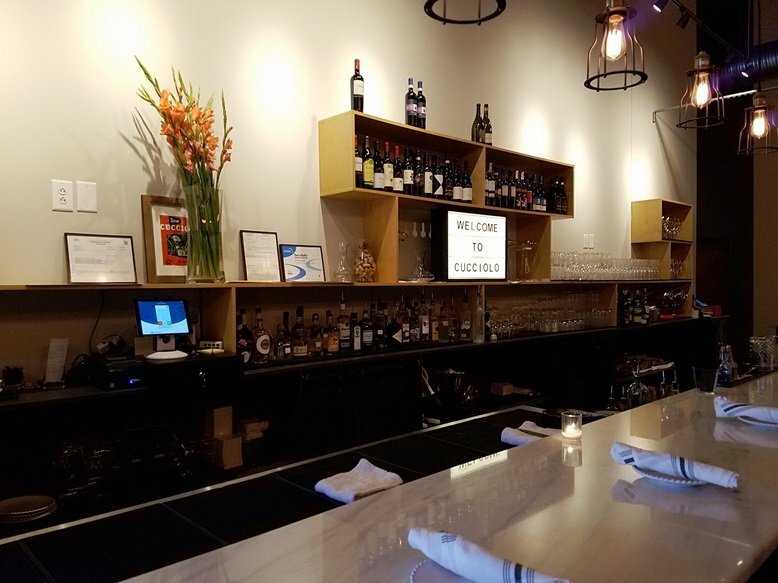 The decor is modern cafe and there’s plenty of space to stretch out in, including a side-bar and side dining room. 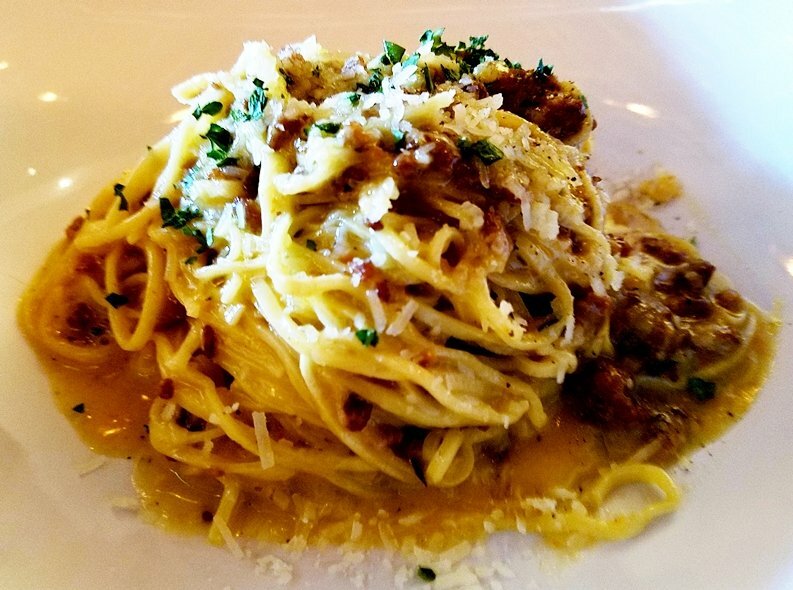 Italian songs and classics are crooning overhead to get you in the Neapolitan mood! Staff is decked out in navy t-shirts keeping the feel pretty casual at Pizza La Stella. Scanning the menu you’ll find a short assortment of antipasto (appetizers), salads, pizza Napoletana, wings and calzones! 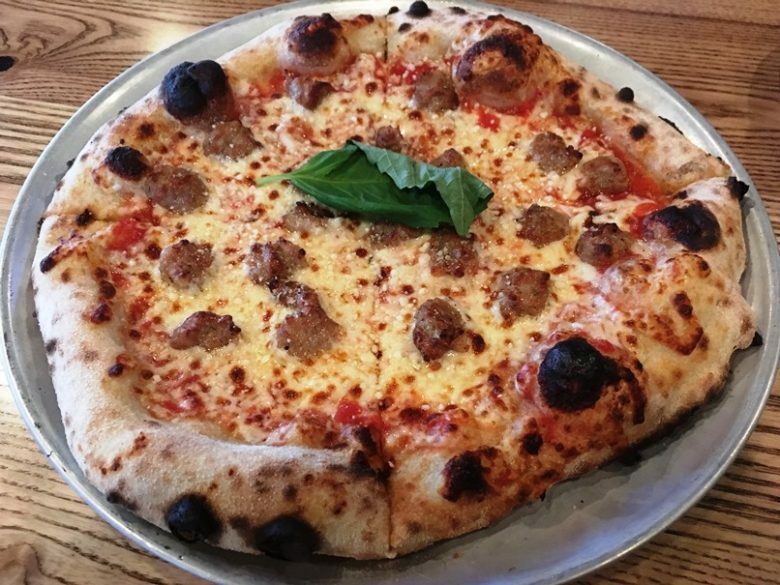 Note that Neapolitan-style pizza is served as individual pies and are a touch pricey at Pizza La Stella, $14 to $18 per pizza. Definitely try the meatball appetizer which is simple but awesome! 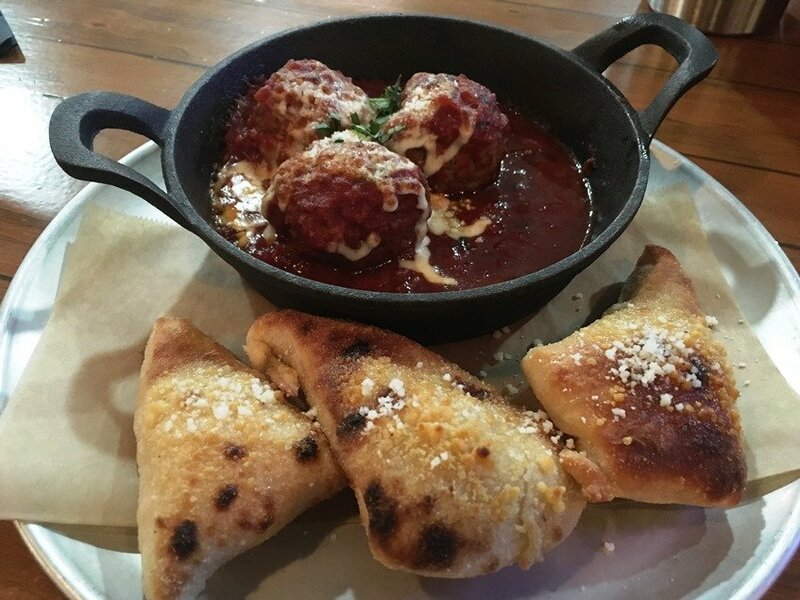 Three, thick meatballs served up seared with tomato sauce and nestled in a cast-iron skillet alongside hunks of oven roasted bread. The meatballs are dense with flavor in a rich, deep tomato sauce, fantastic. Dipping chunks of the oven-fired bread after you’re done with the meatballs is a nice bonus to finish this filling app. On the pizza side of things I’ve tried their classic margherita which sports a leopard-speckled crust, nicely charred. An excellent fluffy crust (cornicione) with a fresh crushed tomato base and mozzarella make for a classic taste. A lunch visit shows off a more classic style of sausage pizza with a blend of cheeses on top but it’s still got that great crust! And at $10 for the lunch pizza with a soft drink, it’s also a very good deal. Overall I’d now put Pizza La Stella in the middle of the pack for Neapolitan because we’ve got some stiff competition out there in the Triangle now! I’ve stopped by for both lunch and dinner, service has been solid for both visits so a thumbs up for the waitstaff. They are young but well-trained which is fine for the casual ambiance here. 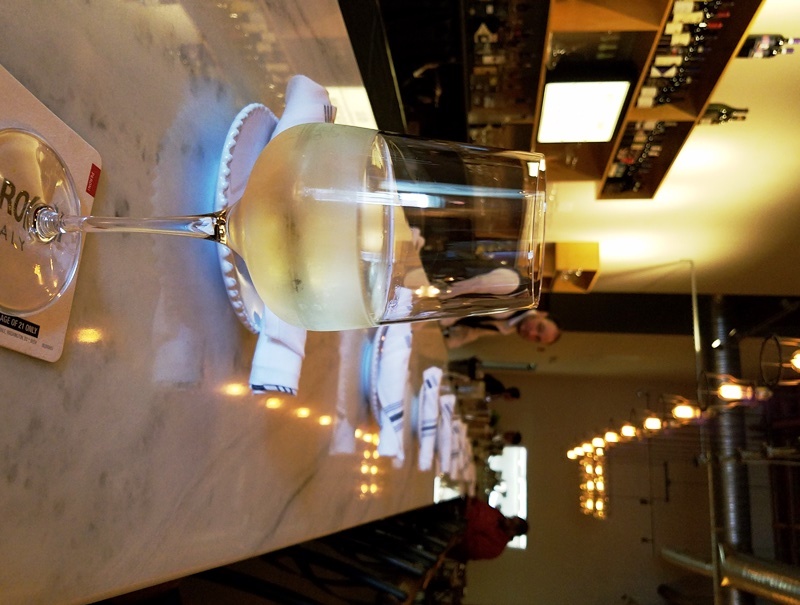 Given I didn’t have sky-high expectations coming in, I am really pleased with what they’ve done at Pizza La Stella, Cary. 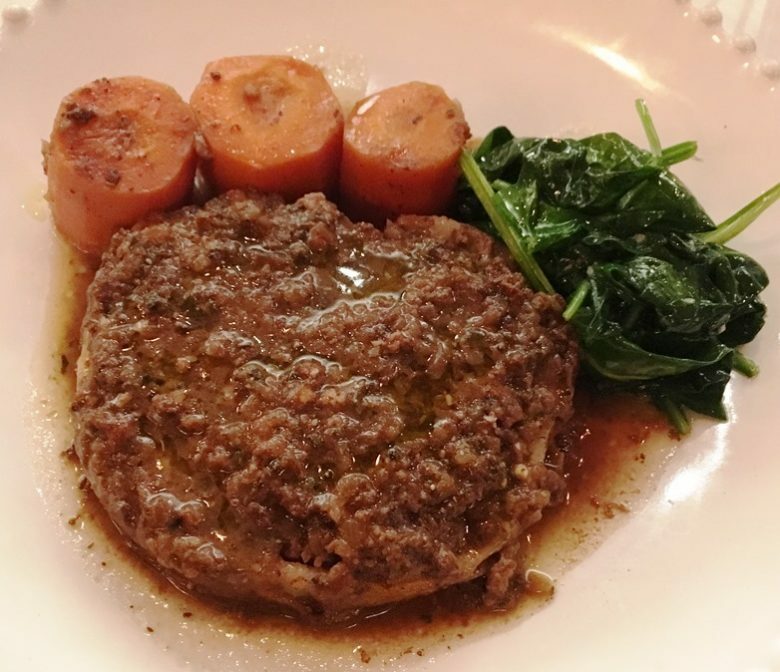 The focus on a simpler menu with the Italian basics works well in my book whether you’re talking about a family or quiet dinner for two. And while it’s certainly not cheap to eat here, it’s worthwhile for the price. And I’m also glad to see that the same changes in the menu have made it to the downtown Raleigh location which will save me 10 minutes of drive time. 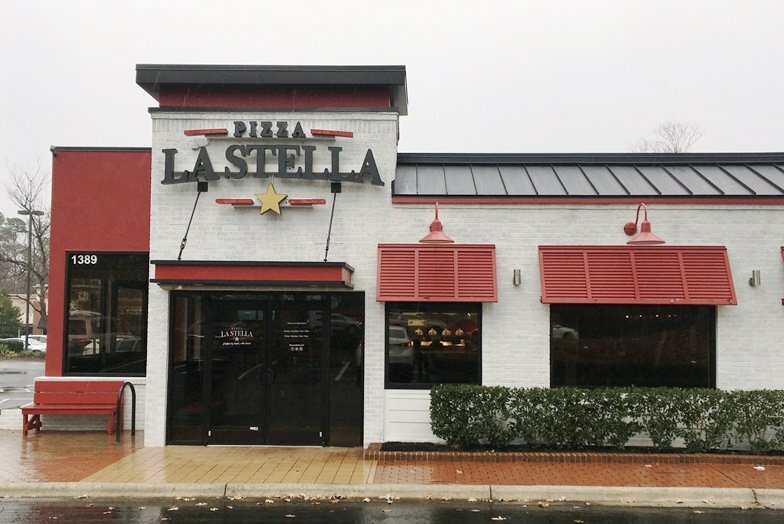 So welcome to Cary, Pizza La Stella! So glad to see you out here and love those delicious Neapolitan pies!